I’ve been basking in my latest speechwriting glory that left the speaker mobbed on the evening and over breakfast the following morning: people pressing grateful congratulations, including people who praised her for ‘helping us think in a different way’. I used to be terrified – the hardest thing I had to do was submit to your approach! I’m not one to boast. But we hit it out of the park! You’re a magician at all this! A wizard!! I was used to talking from a much more ‘narrative’ text – like reading a teleprompter. The way you wrote and laid out the speech differently really helped. This is easier said than done. The challenges are enormous and each context is different. At the same time, the results of our interventions on the ground – as shown, for example, in the video on the Dimitra Clubs in Niger we saw just a moment ago – are encouraging. When rural women are empowered to have more say in decision-making and to enjoy equal access as men to key resources, services and economic opportunities, then agricultural outcomes improve and the rates of poverty and hunger go down. It’s 87 words. Served up to the speaker in a single paragraph: two shortish sentences, then a longer sentence, then a final very long sentence of 38 words. It’s the way 99.9% of UN family organisation speeches are presented to a speaker. Nay, it’s probably better than many of them. The language and ideas are lifeless/’heavy’. There’s nothing in the way the text is presented on the page to the speaker that helps the speaker speak in an energetic engaging way, with just the right emphasis in just the right places. But – we’re getting results! This is some 52 words. A full 35 words shorter! The text is pared to the minimum. No full-stops! Scarcely grammar as such. Tiny ‘sentences’ or just simple phrases, of just a word or two. Yet this text does so much more. It lets the words and ideas and images breathe. The speaker can glance at the page and follow. Improvise. These micro-sentences allow the speaker to run them together or not, as makes sense on the day. Note too how this second version indicates places where the speaker could pause for emphasis. It suggests words that might benefit from extra stress. It uses punctuation to help the speaker adjust energy and tone. In short, this version is a transformational improvement. Its very form encourages the speaker to think differently about speaking: to get away from a flat teleprompter-like ‘narrative’ and just express herself boldly and with conviction. BUT, of course, this does not work for the website. People reading the speech there are a different audience, who are indeed reading. The text should be formatted in a more ‘formal’ way to help those people do just that. Rather longer sentences in short paragraphs, precise grammar, smart layout and so on. Whether you’re writing out speech ideas for yourself or for someone else, don’t fool yourself into thinking that the way it looks on your screen in neatly laid out brisk prose paragraphs using nicely turned grammar is what the speaker needs. It’s not. Present the work so that the speaker draws energy and emphasis from BOTH the words AND the layout. 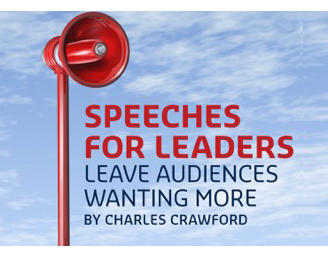 How do you communicate when you write or review someone's speech and if the person has a similar content already. That is, not prose, but only "Tiny ‘sentences’ or just simple phrases, of just a word or two" and the layout? This is quite right. Each sentence or phrase should begin on a fresh line, so that it takes the speaker's eye a micro second to move from the end of one to the beginning of the next. This small delay is just enough to slow one's delivery and so prevent one from falling into the common traps of reading out slabs of prepared written prose (dull) and/or of gabbling too fast (incomprehensible).